EALA is the creation of nationally acclaimed educator and practicing Master Esthetician, Kristin Groop, The Laser Chick®. She has a background in adult education for over 27 years and was an adjunct faculty member of the Maricopa Community College System. Kristin is licensed in the State of Washington as a Master Esthetician and Educator and in the State of Arizona as an Esthetician, Esthetic Instructor, Laser Operator and Laser Instruction Supervisor. After spending seven years as the lead instructor for the nation’s largest laser training school, and listening to feedback from faculty, estheticians, and the thousands of students she had taught, Kristin came to realize that overcrowded classes with a poor student to faculty ratio was impacting both the quality of the education received as well as the employability of the graduates. 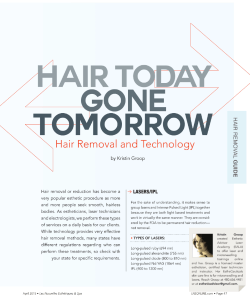 Rather than be a part of a “degree mill” focused on profit, not student success, Kristin created the curricula for Esthetic Advisor Laser Academy in 2010 knowing that there was a better way to train laser operators to increase their skill set and comprehension of the subjects taught. She has used her passion, experience and extensive knowledge to create the most comprehensive laser and medical esthetics training courses available. She is a national speaker and educator, and has been featured in several international esthetic magazines (Les nouvelles magazine, etc.) Kristin has spent years developing research supported and experience tested curricula that are each copyrighted through the Library of Congress. EALA students are taught relevant, timely, valuable information that is truly created and frequently updated by The Laser Chick®. Questions about our programs? Facilities? Financing? We have ANSWERS! Kristin created EstheCeuticals®, the first topical line developed specifically for use with microneedling and laser procedures. EstheCeuticals® provides skincare professionals with topicals that incorporate ingredients that work based on peer-reviewed research, not hype. Kristin is also the co-inventor of the SkinStylus® Microneedling System, the world’s first and only automatic microneedling system that can be autoclave sterilized. SkinStylus® includes the Biolock™ microneedling cartridge invented by Kristin, that incorporates a seven step safety system to prevent liquids from entering the SkinStylus® Find out more about EstheCeuticals® and the SkinStylus® Microneedling System HERE. 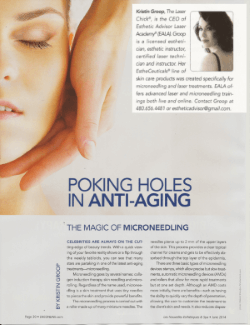 Kristin maintains her own busy practice at Scottsdale Microneedling and Laser Esthetics and uses all the machines and technologies taught at EALA on her clients. Kristin is exceptionally connected in the medical esthetics field and has had great success placing EALA graduates in rewarding careers.